We’re back home, and it’s always good to get home. Family hugs are very much appreciated, the bed is just right, the recliners are comfy, and the guide on the TV is welcome. Who knew I’d ever be so giddy about the guide on the TV, but then I never went two months without one. I don’t know who owns Time Warner, and I don’t care. I just wish they’d be a little more viewer friendly. The temperature has been wicked frigid. With the wind chill, it has been below zero for several days. It was 32 this morning – wahoo. There’s still snow on the ground but mostly where it piled up from the removal process. I picked up my quilt at the long arm quilter’s studio yesterday. Remember, the seven tea towels my sister-in-law embroidered? I put the label on, did the binding on the machine, and now await a visit to gift it to my daughter. I am very happy with how it came out and hope it is in the family for many years to come. And over here, a few states to the west, I work hard to empty my bottles of Chardonnay – I think I need a bottle tree(s) too! I’m glad you are home safe. I worried about you when they showed storms over the Carolinas. Then again when you were on your way back up the NE coast. Grandmas never cease worrying about everybody they love! Your quilt is so special for so many reasons. Beautiful combination of family contributions! I’m a chardonnay girl, myself. Glad you made it home safely! I had to laugh about the guide on the TV. We don’t stay in motels very often but when we do I can never figure out where the channels are. We take a satellite dish with us in the RV so we don’t have that problem when we’re camping. Your quilt is beautiful and I’m sure your daughter will treasure it. I’ve been working in the beds in my butterfly garden so I can plant some new plants in a couple of weeks. Yup! Nothing like loads of laundry to emphasize the reality of being home! What a beautiful quilt the tea towels made. Your daughter will be overjoyed to have it. It’s a family treasure. Can’t wait to see your new projects. The bottle tree sounds intriguing. Maybe if you two really put your minds to it you can create an orchard!! 😂😂 ‘Course you guys may never get to see it because you’ll be in a Rehab somewhere drying out!! But your neighbor’s will love it. Welcome home, Judy. It’s good to see that you made it back in time for the return of winter. We’re worried about a few things that dared to start budding, since we have single-digit lows back in the forecast. The quilt looks great, and it seems you are back in the groove. I hope the Carolina warmth is following you. Welcome back, Judy. We have just fled bitter NH for relatively benign Long Island, NY. Loading day dawned at zero deg, with a 20mph wind off the lake. We nearly froze going back and forth to the truck (the men) and the RV (me and son). Today we do the walk through and closing on a little house in a retirement community, close to many old friends from our 20years here before retiring to the North Country. We loved the NH Lakes and our little cottage, but it was time to move on (or go home, as my wife puts it). So your blog will be a tie to all we enjoyed in NH! Thanks for being there, and the memories you always evoke of the Seacoast! Oh, I will miss your posts of your beautiful lake, but I can imagine a whole new world of photos opening up to you as you settle into a welcoming community. I will look forward to seeing them. 🙂 If anyone understands fleeing the wicked cold it is me. 🙂 I will try to keep you updated on the NH seasons. If I miss something, just shout out and I’ll try to fill it in. I wish you and your wife only happiness and good times. Be healthy and have fun in this new year and this new adventure. Libraries AND fabric stores for me in equal measure. Welcome back! The quilt is lovely! I wish I was a gardener (or at least had the gardener heart), but gardening hereabouts is not anything that the sweet sort can even think about, yet. “Giddy” about the guide on the tv cracked me up! I hear that! My DH has no burning desire to figure out much of technology, so every night in winter, I suss out whatever might be more palatable on tv, lest he just go to bed and read. Which is what we both should do, lol, but sometimes tv is a good pre-book unwinder. What a lovely idea! You’re quilter did a great job on the custom quilting as well. Lovely. Welcome home, Judy! Another cold spell later this week I’m afraid…. and then, fingers crossed some warmer temperatures. Beautiful work ( the quilt) as usual! Welcome home, and I LOVE your quilt – front , back AND close up! Don’t you love the idea of someone using that soft, warm thing of beauty and thinking of you? That’s the best part, I think. Always lovely to be back home isn’t it? …& may warmth & sunshine follow! I love your quilt & look forward to seeing this intriguing bottle tree! A lovely family heirloom, Judy. Hope spring comes soon. The cold weather sounds really dire. The TV. The bed. The soft sofa. And yes, just … being home. Welcome back. And yeah, it’s really COLD. It’s supposed to warm up tomorrow, but dip down again in a few more days. Beautiful quilt! I would like to make a bottle tree like I’ve seen on Pinterest… have you ever posted a picture of yours? I have just the spot for it in my garden and I’m more than willing to put the work in necessary to empty the bottles (for the sake of art, you know). Love that quilt! What exquisite work. Lovely quilt, Judy! Sure your daughter will like it. When it comes to your quilting, I am speechless. Such skill is so beyond me. What an incredible gift! And you certainly do seem to be in a place that needs all the quilts it can get; those temperatures are pure misery. I want to add my voice to those above in commending you for your blue-bottle sacrifice for art. I too look forward to seeing your bottle tree if the ground ever thaws there. Welcome home! It’s a drag that you had to hit home when it had turned SO cold but, on the other hand, it gives you the perfect excuse to hunker down and sew. I love what you did with the day-of-the-week towels–the look is so retro and just right! Welcome home snowbird! I agree with Kerry–think of the cold spell as a wee bit of time to sew before you get outside scratching in the soil. I imagine you grinning ear to ear when you walked in your fabric store and let the lovely fabric-y essence wash over your senses. 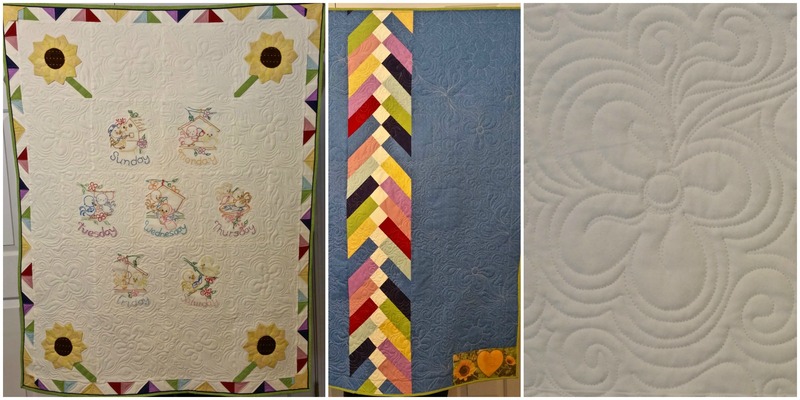 Your quilt is gorgeous–love the colors. Glad to hear you are home safely, and the loads of laundry is done! I know how you feel. I always love coming home to my own bathroom. Your quilt is gorgeous and I’m impressed by the lovely quilting. Hope you had a great winter getaway Judy. After such an early spring we’re expecting snow this weekend. Ick. Poor little flowers. Your quilt is very lovely. Beautiful job by the long arm quilter, and lovely work by you piecing! I love your borders and your pieced back!! Family treasure! I see Susie’s magic binding on this! That’s right, and I think of you every time I use it. 🙂 I went to a quilt show in Myrtle Beach the end of February, and I saw it used on several quilts there. I know you are happy to be home but boy the weather you have come back to. The weathermen certainly were wrong with their forecast for the month. You have created such a wonderful quilt that will certainly be enjoyed by your daughter and family for years to come…lovely!